2nd ed. rev. and enl..
30 p. : ill., map ; 24 cm. Cover title: Official handbook of the Panama Canal. 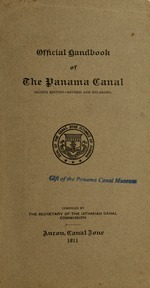 compiled by the secretary of the Isthmian Canal Commission. Gatun Lake, channel depth (feet) ............... .. . Concrete, total estimated for Canlal .cubic yardsl..
Time of transit through completed Canal i.hours) . Relocated Panama Railroad, length imiles)..
(ab o u t .. .............. .
D ate of com pletion................................................... .
70 36', and the largest 300.
about 21,000,000 cubic yards of material. contain about 225,000 cubic yards of concrete. the water level of the Lake. ^ fflH If''`- I 1"o^^S''? Water Supply of Gatun Lake. ficient quantity to fill the lake one and. a half times. lock to the other through the central wall is employed. gation of 1909, whiclf was about eight months long. day, with a total tonnage for the year of 15,500,000.
of Miraflores locks with the high ground on either side. the same-a length of 1,000 feet, and width of 110 feet. concrete, and mitering gates at each end. and the upper will be a passageway for the operators. navigating the high seas are less than 600 feet long. Model of Pedro Miguel Locks. ance in the chamber when it is being filled or emptied. will be 40 feet in salt water and 411 feet in fresh water. the same time in the three locks on the Pacific side. at which it can travel. moved by the Americans, and the slide is still active. tractor's Hill, covering about twenty-eight acres. million cubic yards are still in motion. 40 to 39 feet above sea level in the Chagres section. May 4, 1904 to May 1, 1911. Culebra Cut.-... 62,814,749) 745o 5 8 21,371,975 . Capacity of Steam Shovels and Dirt Trains. of 3 of a cubic yard. and is said to represent about a two-horse cart load. of "the run of the cut." 27 cars, and the small dump train of 35 cars. small dump cars are operated by hand. were run to and from the dumping grounds. Toro Point, armored with hard rock from Porto Bello. on May 1, 1911, the fill had been extended 4,214 feet. second, to insure a more quiet harbor at Balboa. it had been constructed for a distance of 13,000 feet. Canal Force, Quarters and Supplies. Company. Practically all of them are Americans. the Commission and the Panama Railroad Company. cents an hour, and the rest 16 cents an hour. Food, Clothing and Other Necessaries. cream, laundry and packing department. 100,000 meals served monthly at these kitchens. Value of the $40,000,000 French Purchase. The Canal Zone contains about 448 square miles. on each side of the center line of the route of the Canal. which are owned by private persons. is 47.1 miles long, or slightly shorter than the old line. new line is estimated at $9,000,000. The Panama Canal (Contintued.) above Pedro Miguel locks and extends about 8 miles through Culebra Cut, with the exception that at all angles the channel is widened sufficiently to allow a thousand-foot vessel to make the turn. The Cut has eight angles, or about one to every mile. The 300foot widths are only on tangents between the turning basins at the angles. The smallest of these angles is 70 36', and the largest 300. In the whole Canal there are 22 angles, the total curvature being 600' 51'. Of this curvature, 2810 10' are measured to the right, going south, and 319* 41' to the left. The sharpest curve occurs at Tabernilla, and is 670 10'. Gatun Dam. The Gatun Dam. which will form Gatun Lake by impounding the waters of the Chagres and its tributariEs, will be nearly l miles long, measured on its crest, nearly i mile wide at its base, about 400 feet wide at the water surface, about 100 feet wide at the top, and its crest, as planned, will be at an elevation of 115 feet above mean sea level, or 30 feet above the normal level of the Lake. Of the total length of the Dam only 500 feet, or I, will be exposed to the maximum water head of 85 feet. The interior of the Dam will be formed of a natural mixture of sand and clay, dredged by hydraulic process from pits above and below the Dam, and placed between two large masses of rock and miscellaneous material obtained from steam shovel excavation at various points along the Canal. The top and upstream slope will be thoroughly riprapped. The entire Dam will contain aIbout 21 ,000,000 cubic yards of material. The Spillway is a concrete lined opening, 1,200 feet long and 300 feet wide, cut through a hill of rock nearly in the center of the Dam. the bottom of the opening being 10 feet above sea level. It will contain about 225,000 cubic yards of concrete. During the construction of the Dam, all the water discharged from the Chagres and its tributaries will flow through this opening. When construction has advanced sufficiently to permit the Lake to be formed, the Spillway will be closed with a concrete dam, fitted with gates and machinery for regulating the water level of the Lake. Water Supply of Gatun Lake. Gatun Lake will impound the waters of a basin comprising 1,320 square miles. When the surface of the water is at 85 feet above sea level, the Lake will have an area of about 164 square miles, and will contain about 206 billion cubic feet of water. During eight or nine months of the year, the lake will be kept constantly full by the prevailing rains, and consequently a surplus will need to be stored for only three or four months of the dry season. The smallest run-off of water in the basin, during the past 21 years, as measured at Gatun, was about 146 billion cubic feet. In 1910 the run-off was 360 billion cubic feet, or a sufficient quantity to fill the lake one and. a half times. The water surface of the Lake will be maintained during the rainy season at 87 feet above sea level, making the minimum channel depth in the Canal 47 feet. As navigation can be carried on with about 41 feet of water, there will be stored for dry season surplus over five feet of water. Making due allowance for evaporation, seepage, leakage at the gates, and power consumption, this would be ample for 41 passages daily through the locks, using them at full length, or about 58 lockages a day when partial length is used, as would be usually the case, and when cross filling from one lock to the other through the central wall is employed. This would be a larger number of lockages than would be possible in a single day. The average number of lockages through the Sault Ste. Marie Canal on the American side was 37 per day in the season of navigation of 1909, which was about eight months long. The average number of ships passed was about 11per lockage. The freight carried was more than 30,000,000 tons. The Suez Canal passed about 12 vessels per day, with a total tonnage for the year of 15,500,000. VPPCC6r bleyof rrn to b t-rtc k ted by lee t thicknes.o ;a2olSovr Other >o d 1,k foil t -w ---)1 -Water Leve + AS: .-----------~-.$ -FInu ic 5 LL--** M steMaterial -ft ea ---v------------------90.----------------Cross Section Gatun Darn. A-CN k' #'' 5 ~~ L~ F F F F F E F F, Cross Section of Lock Chamber and Walls Qi Locks. A-Passageway for operators. E-These culverts run under the lock floor B-Gallery for electric wires. and alternate with those from sidewalls. F-Wells opening from lateral culverts into C-Drainage gallery. lock chamber. D-Culvert in center wall. G--Culvert in sidewalls. Hl--Lateral culverts. 13 Model of Pedro Miguel Locks. The lock on the right is nearly filled for an upward lockage. Four electric locomotives are shown securely holding a 10,000-ton ship, and ready to Low it out of the lock, so soon as the upper gates are opened. In the foreground is shown a protective chain; at the entrance to the lock on the left is shown a caisson in position and acting as a barrier between the high level above and the low level below the lock. On the right is shown an emergency dam in its normal position when not in use and on the left the other dam is shown swung in position across the lock with the wicket girder down in readiness to support the wickets or gates which complete the barrier. 14 The Locks (Continued.) taken in or paid out without actual motion of the locomotive on the track. The locks will be filled and emptied through a system of culverts. One culvert 254 sq. ft. in area of cross section, about the area of the Hudson River tunnels of the Pennsylvania Railroad, extends the entire length of each of the middle and side walls and from each of these large culverts there are several smaller culverts, 33 to 44 sq. ft. in area, which extend under the floor of the lock and communicate with the lock chamber through holes in the floor. The large culverts are controlled at points near the miter gates by large valves and each of the small culverts extending from the middie wall culvert into the twin chambers is controlled by a cylindrical valve. The large culvert in the middle wall feeds in both directions through laterals, thus permitting the passage of water from one twin lock to another, effecting a saving of water. (See cuts.) To fill a lock the valves at the upper end are opened and the lower valves closed. The water flows from the upper pool through the large culverts into the small lateral culverts and thence through the holes in the floor into the lock chamber. To empty a lock the valves at the upper end are closed and those at the lower end are opened and the water flows into the lower lock or pool in a similar manner. This system distributes the water as evenly as possible over the entire horizontal area of the lock and reduces the disturbance in the chamber when it is being filled or emptied. The depth of water over the miter sills of the locks will be 40 feet in salt water and 414 feet in fresh water. The average time of filling and emptying a lock will be about fifteen minutes, without opening the valves so suddenly as to create disturbing currents in the locks or approaches. The time required to pass a vessel through all the locks is estimated at 3 hours; one hour and a half in the three locks at Gatun, and about the same time in the three locks on the Pacific side. The time of passage of a vessel through the entire Canal is estimated as ranging from 10 to 12 hours, according to the size of the ship, an11d the rate of speed at which it can travel. 15 Side Wall of Locks Compared with Six-story Building. 1; Slides. There are in all twenty-one slides along the Culebra Cut. Twelve cover areas varying from one to fortyseven acres, and nine cover areas of less than one acre each, making in all a total of one hundred and fortynine acres. The largest is the Cucaracha slide, on the east side of the Canal, which covers an area of fortyseven acres., and which has broken back 1,820 feet from the center line of the Canal. This slide, according to French records, started as early as 1884, and has given the Americans considerable trouble since they began work. Over two million cubic yards have been reimoved by the Americans, and the slide is still active. The next largest slide is a combination of two slides on the west side of the Cut at Culebra, just north of Contractor's Hill, covering about twenty-eight acres. Over two million cubic yards have been removed from this slide, and it is estimated that one million cubic yards are still in motion. On the east side of the Cut, north of Gold Hill, is another large slide covering an area of about seventeen acres which has broken back 1,200 feet from the center line of the Canal. Over 416,000 cubic yards have been taken out of this slide and about three-quarters of a million more are still in motion. The total distance across the Cut at this point from back to back of slides is 1,950 feet. In all, over nine million cubic vards have been taken out since July, 1905, because of slides, and over three million cubic vards are still in motion. Excavation. The total excavation, dry and wet, for the Canal, as originally planned, was estimated at 103,795,000 cubic yards, in addition to the excavation by the French coimpanies. Changes in the plan of the Canal, made subsequently by order of the President, increased the amount to 174,666,594 cubic yards. Of this amount, 89,794,493 cubic yards were to be taken from the Central Division, which includes the Culebra Cut. In July, 1910, a further increase of 7,871,172 cubic yards was made, of which 7,330,525 cu bic yards were to allow for slides in Culebra Cut, for silting in the Chagres section, and for lowering the bottom of the Canal from 40 to 39 feet above sea level in the Chagres section. 90 Capacity of Steam Shovels and Dirt Trains. There are several classes of steam shovels engaged in excavating work, equipped with dippers ranging in capacity from 1 cubic yards to 5 cubic yards, and a trenching shovel, which has a dipper with a capacity of i of a cubic yard. Each cubic yard, place measurement. of average rock weighs about 3,900 pounds; of earth, about 3,000 pounds; of "the run of the cut," about 3,600 pounds, and is said to represent about a two-horse cart load. Consequently, a five cubic yard dipper, when full. carries 8.7 tons of rock, 6.7 tons of earth, and 8.03 tons of "the run of the cut." Three classes of cars are used in hauling spoil-flat cars with one high side, which are unloaded by plows operated by a cable upon a winding drum, and two kinds of dump cars, one large and one small. The capacity of the flat cars is 19 cubic yards; that of the large dump cars, 17 cubic yards, and that of the small dump cars, 10 cubic yards. The flat car train is ordinarily composed of 20 cars in hauling from the cut at Pedro Miguel, and of 21 cars in hauling from the cut at Matachin. The large dump train is composed of 27 cars, and the small dump train of 35 cars. The average load of a train of flat cars, in hauling the mixed material known as "the run of the cut," is 610.7 tons (based on a 20-car train); of a train of large dump cars, 737.68 tons, and of a train of small (lumps, 562.5 tons. The average time consumed iin unloading a train Of flat cars is from 7 to 15 minutes; in unloading a train of large dump cars, 15 to 40 minutes; and in unloading a train of small dump cars, 6 to 56 minutes. The large dump cars are operated by compressed air power furnished by the air pumIip of the locomotie, while Ihe small (lump cars are operated by hand. The record day's work for one steam shovel was that of March 22, 1910, 4,823 cubic yards of rock (place measurement), or 8,395 tons. The highest daily record in the Central Division was on March 11, 1911, when 51 steam shovels and 2 cranes equipped with orange peel buckets excavated an aggregate of 79,484 cubic yards, or 127,742 tons. During this day, 333 loaded trains and as many empty trains were run to and from the dumping grounds. 22 Breakwaters. Breakwaters are under construction at the Atlantic and Pacific entrances of the Canal. That in Limon Bay, or Colon harbor, extends into the bay from Toro Point at an angle of 42 degrees and 53 minutes northward from a base line drawn from Toro Point to Colon light, and will be 10,500 feet in length, or 11,700 feet, including the shore connection, with a width at the top of fifteen feet and a height above mean sea level of ten feet. The width at the bottom will depend largely on the depth of water. It will contain approximately 2,840,000 cubic yards of rock, the core being formed of rock quarried on the mainland near Toro Point, armored with hard rock from Porto Bello. Work began on the breakwater in August, 1910, and on May 1, 1911, the fill had been extended 4,214 feet. The estimated cost is $5,500,000. A second breakwater has been proposed for Limon Bay, but this part of the project has not been formally acted upon. The purpose of the breakwaters is to convert Limon Bay into a safe anchorage, to protect shipping in the harbor of Colon, and vessels making the north entrance to the Canal, from the violent northers that are likely to prevail from October to January, and to reduce to a minimum the amount of silt that may be washed into the dredged channel. The breakwater at the Pacific entrance will extend from Balboa to Naos Island, a distance of about 17,000 feet, or a little more than three miles. It will lie from 900 to 2,700 feet east of and for the greater part of the distance nearly parallel to the axis of the Canal prism; will vary from 20 to 40 feet in height above mean sea level, and will be from 50 to 3,000 feet wide at the top. It is estimated that it will contain about 18,000,000 cubic yards of earth and rock, all of which will be brought from Culebra Cut. It is constructed for a two-fold purpose; first, to divert cross currents that would carry soft material from the shallow harbor of Panama into the Canal channel; second, to insure a more quiet harbor at Balboa. Work was begun on it in May, 1908. On May 1, 1911, it had been constructed for a distance of 13,000 feet. 2.1 Canal Force, Quarters and Supplies. The Canal force is recruited and housed by the Quartermaster's Department which has two general branches, labor and quarters, and material and supplies. Through the labor and quarters branch there have been brought to the Isthmus 43,432 laborers, of whom 11,797 came from Europe, 19,448 from Barbados, the balance from other islands in the West Indies and from Colombia. No recruiting is required at present, the supply of labor on the Isthmus being ample. On May 1, 1911, the total force of the Isthmian Canal Commission and Panama Railroad Company, actually at work, was divided as follows: Gold Silver Total Isthmian Canal Commission .4,540 23,592 28,132 Panama Railroad Company (proper) 467 3,639 4,106 Panama Railroad Relocation.-. 121 2,201 2,322 Panama Railroad Commissary. 219 Soo 1,019 Totals. .5,347 30,232 35,579 The gold force is made up of the officials, clerical force, construction men, and skilled artisans of the Isthmian Canal Commission and the Panama Railroad Company. Practically all of them are Americans. The silver force represents the unskilled laborers of the Commission and the Panama Railroad Company. Of these, about 4,500 are Europeans, mainly Spaniards, with a few Italians and other races. The remainder, about 25,000, are West Indians, about 3,700 of whom are employed as artisans receiving 16, 20, and 25 cents, and a small number, 32 and 44 cents, an hour. The standard rate of the West Indian laborer is 10 cents an hour, but a few of these doing work of an exceptional character are paid 16 and 20 cents. The larger part of the Spaniards are paid 20 cents an hour, and the rest 16 cents an hour. The material and supply branch carries in eight general storehouses a stock of supplies for the Commission and Panama Railroad valued approximately at $4,500,000. About $12,000,000 worth of supplies are purchased annually, requiring the discharge of one steamer each day. Food, Clothing and Other Necessaries. The Canal and Panama Railroad forces are sup)IitLd with food, clothing and other necessaries through the Subsistence Department, which is divided into two branches-Commissary and Hotel. It does a business of about seven million five LIundred thousand dollars per annum. The business done by the Commissary Department amounts to about 86,000,000 per annum, and that done by the hotel branch to about $1,500,000 per annum. The Commissary system consists of 22 general stores in as many Canal Zone villages and camps along the relocated line of the Panama Railroad. It is estimated that with employes and their dependents, there are about 65,000 people supplied daily with food, clothing, and other necessaries. In addition to the retail stores, the following plants are operated at Cristobal: cold storage, ice making, bakery, coffee roasting, ice cream, laundry and packing department. A supply train of 21 cars leaves Cristobal every morning at 4 a. m. It is composed of refrigerator cars containing ice, meats and other perishable articles, and ten containing other supplies. These are delivered at the stations along the line and distributed to the houses of emlploves by the Quartermaster's Department. The hotel branch maintains the Hotel Tivoli at Ancon, and also 18 hotels along the line for white gold employes at which meals are served for thirty cents each. At these t8 hotels there are served monthly about 200,000 meals. There are sixteen messes for European laborers, who pay 40 cents per ration of three meals. There are served at these messes about 270,000 meals per month. There are also operated for the West Indian laborers fourteen kitchens, at which they are served a ration of three meals for 27 cents per ration. There are about 100,000 meals served monthly at these kitchens. The supplies for one month for the line hotels, messes and kitchens cost about $85,000; labor and other expenses about $17,500. The monthly receipts, exclusive of the revenue from the Hotel Tivoli, amount to about $105,000. Value of the $40,000,000 French Purchase. A careful official estimate has been made by the Canal Commission of the value to the Commission at the present time of the franchises, equipment, material, work done, and property of various kinds for which the United States paid the French Canal Company $40,000,000. It places the total value at $42,799,826, divided as follows: Excavation, useful to the Canal, 29,708,000 cubic yards-.------------.-.$25,389,240.00 Panama Railroad Stock .9,644,320.00 Plant and material, used and (d for scrap 2,112,063.00 Bulil ings, used----------------------------2,054,203.00 Surveys, plans, maps and record I .-------------2,000,000.00 Land ----------------------....1,000,000.00 Clearing, rmads, etc. -------------100,000.00 Ship channel in Panama Bay, i; year usv. 500,000.00 Total --------------------------S42,799.826.00 The Canal Zone. The Canal Zone contains about 448 square miles. It begins at a point three marine miles from mean low water mark in each ocean, adi(1 extends for five miles on each side of the center line of the route of the Canal. It includes the group of islands in the Bay of Panama named Perico, Naos, Culebra. and Flamenco. The cities of Panama and Colon are excluded from the Zone, but the United States has the right to enforce -;anitary ordinances in those cities, and to maintain public order in them in case the Republic of Panama should not he able, in the jt(gent of the Uinited StIates, to do so. Of the 448 square miles of Zone territory, the United States owns the larger portion, the exact amount of which is being determined by stirvey. Under the treaty with Panama. the Utnited States has the right to acquire by purchase, or by the exercise of the right of emi neilit domain, any lands, buildings, water rights, r other properties necessa ry and convenient for the constriction, 1naitnt enance, operation, san itation, and protection of the Canal, and it can,. therefore, at any time acqutire the lands withiii the Zoin boundaries which are owned by private persons. Canal Appropriations and Expenditures. APPROPRIATIONS Payment to the New Panama Canal Company$40,000,00000 Payment to Republic of Panama 10,000,000.00 Appropriation, June 28, 1902. 10,000,000.00 Appropriation, December 21, 1905 11,000.000.00 Deficiency, February 27, 1906 -5,990,786.00 Appropriation June 30, 1906 25,456415.08 Appropriation, March 4. 1907 -27,161 ,367.50 Deficiency, February 15, 1908 12,178,900.00 Appropriation, May 27, 1908 -29,187,000.00 Deficiency, March 4, 1909 -5,458,000.00 Appropriation, March 4, 1909 -33,638,000.00 Deficiency, February 25, 1910 76,000.00 Appropriation, June 25, 1910 -37,855,000.00 Private Act. Relief of Elizabeth G. Martin 1,200.00 Private Act. Relief of Marcellus Troxell 1,500.00 Private Act. Relief of W. L. Miles --------------1,704.18 Private Act. Relief of Chas. A. Caswell 1,056.00 Appropriation, March 4, 1911 -45,500,000.00 Total .--. .8293,566.,28.76 CLASSIFIED EXPENDITURES TO APRIL 1, 1911 Department of Construction and Engineering108,841,789.99 Department of Construction of Engin'ring-Plant 8,581,385.30 Department of Sanitation ---------------------12,775,053.94 Department of Civil Administration .4,714,030.52 Panama Railroad, Second Main Track -----------1,125,766.28 Panama Railroad, Relocated Line ---------------6,331,631.48 Purchase and Repair of Steamers -2,657,384.88 Zone Water Vorks and Sewers -4,365,053.09 Zone Roadways -----------------------------1,512,869.34 Loans to Panama Railroad 3,247,332.11 Construction and Repair of Buildings,------------9949,267.23 Purchase from New Panama Canal Company 40,000,000.00 Payment to Republic of Panama ---------------0,000,000.00 Miscellaneous. 4,127,106.76 Total-. 218,228,670.92 The balances carried in expenditure accounts, which are included in the last item above, for water works, sewers and pavements in the cities of Panama and Colon amounted altogether to $2,146,695.52. The unexpended balancein the appropriation for sanitation in the cities of Panama and Colon, available for expenditures on water works, sewers and pave.ments was $334,965.56, including transfer of appropriations for quarter ended March 31. 2,S Relocated Panama Railroad. The new, or relocated line of the Panama Railroad is 47.1 miles long, or slightly shorter than the old line. From Colon to Mindi, 4.17 miles, and from Corozal to Panama, 2.83 miles, the old location is used, but the remaining 4( miles are new road. From Mindi to Gatun the railroad runs, in general, parallel to the Canal, and ascends front a few feet above tide water elevation to nearly 95 feet above. At Gatun the road leaves the vicinity of the Canal and runs eastalong the valley of the Gatun River to a point about 4'miles from the center line of the Canal, where it turns southward again and skirts the east shore of Gatun Lake to the beginning of Culebra Cut, at Bas Obispo. In this section there are several large fills, occurring where the line crosses the Gatun Valley and near the north end of Culebra Cut, where the line was located so as to furnish waste dumps for the dirt from the Canal. Originaliv it was intended to carry the railroad through Culebra Cut on a 40-foot berm, 10 feet above the water level, but the numerous slides have made this plan impracticable and a line is now being constructed around the Cut, known locally as the (old Hill Line. Leaving the berm of the Canal at Bas Obispo, the Gold Hill Line gradually works into the foot hills, reaching a distance from the center line of the Canal of two miles opposite Culebra; thence it runs down the Pedro Miguel Vallev to Paraiso, where it is only 800 feet from the center line of the Canal. This section of the line is located on maximum grade of 1.25 per cent. compensated, and has a total length of 9' miles. The sharpest curve on the whole line is 7'. From the south end of Culebra Cut at Paraiso, the railroad runs practically parallel with the Canal to Panama, with maximum grade of 0.45) per cent. Where the railroad crosses the Gatun River, a bascule steel bridge is to be erected. and a steel girder bridge, i mile long, with 200-foot through truss channel span, is in use across the Chagres River at Gamboa. Small streams are crossed on reinforced concrete culverts. Near Miraflores, a tunnel 736 feet long has been built through a hill. Total cost of new line is estimated at S9,000,000.